The Toledo DPPlus unit is a basic press automation and control system that integrates die protection, programmable limit switches, brake monitoring and job storage into an encoder-based package. 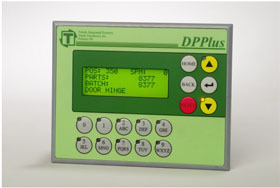 The DPPLUS unit itself is a "loose" package and is designed for mounting in a NEMA rated enclosure or a panel. The DPPlus comes standard with 4 die protection inputs, 8 programmable limit switch outputs, brake monitor, parts and batch counters, separate immediate stop and top stop outputs and configurable message inputs. The DPPlus has the capability to store information for 50 jobs. The DPPlus automation package is designed for basic automation needs such as die protection, programmable limit switches and brake monitoring. This basic automation package includes a clutch/brake controller, the Press Pilot 150. To read more about the DPPlus basic automation package, click here or contact us directly at 1-800-TTOLEDO. Dimensions 6 " 4.75 " 3.5 "